a discussion about the research and findings of BLACK THEATRE SURVEY 2016-2017: A REPORT ON THE HEALTH OF BLACK THEATRE IN AMERICA. Dominique talks about her Detroit Trilogy, her influences and intentions as a playwright, and the contemporary realities of Jim Crow Theatre. NYC-based professionals Tiffany Renee Thompson & Taylor N. Daniels talk about what it means to be a working black actor in the American Theatre. 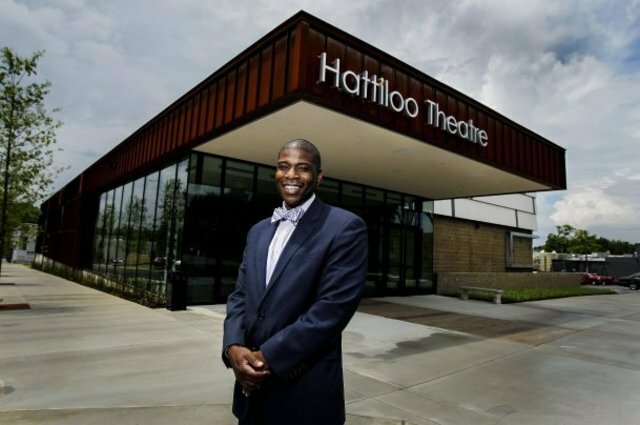 Ekundayo Bandele , Founder & Chief Executive Officer of Hattiloo Theatre, talks about his career, the origins & history of the theatre, and his vision for moving forward. As part of the Black Theatre Network 2018 Conference, this podcast recording addresses how Black theatre in Memphis works, & the role Hattiloo plays in both the local and national theatre communities. Angelica Cheri discusses her new work, "Berta, Berta" just before its world premiere at the Contemporary American Theatre Festival. to listen to the j. cole song referenced in the interview, click here. to check out the version of the work song 'berta, berta' performed in the film version of 'the piano lesson,' check out this video. to hear a live version of the song (froma staged reading of 'the piano lesson') check out this stunning performance at nyc greenspace. Carlyle Brown: "Down In Missippi" & "Abe Lincoln and Uncle Tom in the White House"
playwright, performer, & producer Carlyle Brown discusses his early career & his two new publications: "Down In Missippi" & "Abe Lincoln and Uncle Tom in the White House"
for more information about Carlyle Brown & Company, please visit their website. donald e. lacy has been touring his one-man show, "colorstruck," for the past six years. upon the inauguration of our 45th president, he has begun touring the show as "colorstruck: surviving the trumpocalypse." he discusses the work in this episode. With special permission from Carlton Molette, students from across the nation (but predominately Wayne State University Department of Theatre & Dance) read the 10-minute play, "Our Dreams." Host kb saine frames the reading with a celebration of Barbara Molette's life. Greg Horton, costume designer: Live from BTN! kb saine speaks with reginald wilson about Sugar Ray, a one-man show written by lawrence holder, directed by woodie king, and performed by reggie wilson. the play tells the full story of the life of sugar ray robinson, the famed middleweight boxing champion. kb saine hosts a discussion woodie king (with special guest selaelo maredi castillo) about the new federal theatre's work & about the social impact & implications of race in contemporary theatre. Ethyl Pitts Walker details who was in the room & what pieces were in place for the founding of The Black Theatre Network in 1986.